There is no doubt about who the market leader is. The only question is whether Apple maintained its position on the market during the past three months on the market segment it created with the iPad. IDC has taken the market under its loupe and has the numbers. 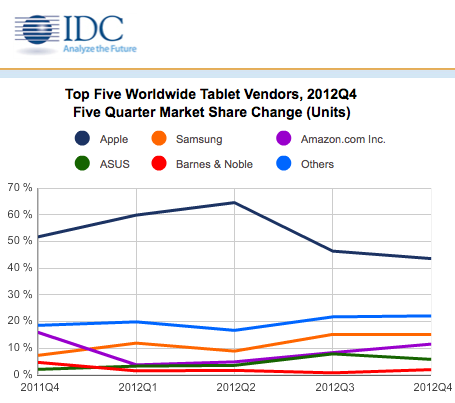 During the past quarter, tablets have reached a record 52.5 million units shipped on a global scale, the IDC data shows, with the market growing a significant 75.3% on a year-over-year basis, up from 29.9 million units recorded in Q4 of 2011. 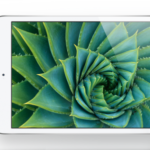 As Tim Cook highlighted, Apple has sold a record 22.9 million iPad units during the last 13-weeks of 2012, which was in line with IDC’s forecast based on a strong iPad mini and the fourth generation iPad launch. 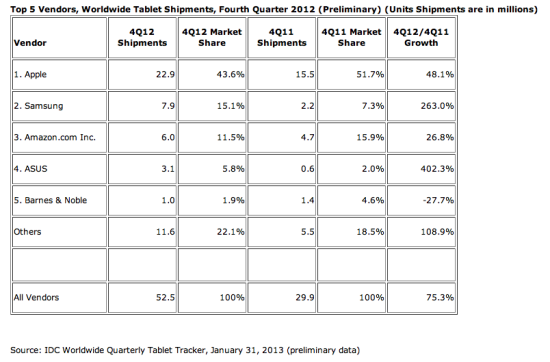 The competition is getting stronger, however, leading to a declining market share for the second quarter in a row: the iPad now accounts for 43.6% of the total tablet shipments. Samsung, on the other hand, reported an impressive 263% year-over-year growth, shipping nearly 8 million Android and Windows tablets during the past quarter, which reserved the South Korean manufacturer 15.1% of the global tablet market, the same share as the previous quarter. An interesting increase is coming from Amazon as they shipped more than 6 million tablets, increasing its share to 11.5%, up from 8.3%, while the fresh entrant Microsoft has failed to reach the top-five after shipping roughly 900,000 Surface tablets.